The award is in recognition of PEG Africa’s innovative approach to providing affordable renewable energy solutions to rural communities to replace harmful and expensive use of batteries, candles and kerosene. “PEG is dedicated to ensuring that every Ghanaian home across the country has access to affordable and reliable energy. We are committed to reducing the reliance on poor quality polluting fuels and we will continue to work to bridge the gaps on energy poverty and financial inclusion through solar technology”. Along with its most recent SME Ghana Award, PEG Africa has earned many prestigious awards including the international Ashden Award (UK) for Innovative Financing, being named by London Stock Exchange as one of the Fast Growing Companies in Africa, and being referenced by the BBC as a Top 5 Technology Trend in Africa (2018). PEG Africa provides solar home systems on credit to households in West Africa. Using a unique financing approach, called ‘pay-as-you-go’ financing, PEG enables customers to replace their perpetual spending on poor-quality polluting fuels, such as kerosene, with solar energy that quickly becomes an asset the customer owns. 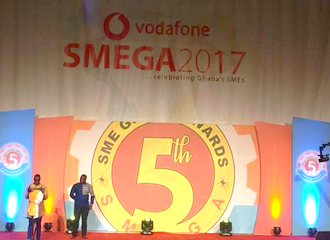 The SME Ghana Awards (SMEGA) is an annual National Award Scheme for Micro, Small and Medium-sized Enterprises (MSMEs). SMEGA is instituted to recognize the countless achievements of Micro businesses, SMEs and Individuals of Entrepreneurial excellence in Ghana. The award focuses on innovation, creativity, productivity and the use of technology for business growth in the SME sector.